The Kona Crime Prevention Committee recognized Officer Jason Foxworthy as “Officer of the Year” in a luncheon ceremony Wednesday (September 14) at King Kamehameha’s Kona Beach Hotel in Kailua-Kona. Foxworthy was honored for an investigation into an auto theft. On January 16, Foxworthy and a recruit he was training, Officer Dayson Taniguchi, were assigned to a vehicle theft at a shopping center in Kona. Through interviews of possible witnesses, they identified a suspect. When they located the suspect, he had drug paraphernalia and brass knuckles in his possession. After his arrest, detectives recovered the stolen vehicle, along with 2.4 grams of crystal methamphetamine. Also in January, Foxworthy and Taniguchi investigated 36 incidents, three traffic accidents and 50 miscellaneous public complaints. They made 14 adult arrests and issued 57 traffic citations. Foxworthy received an “Officer of the Month” award in March for the same investigation. 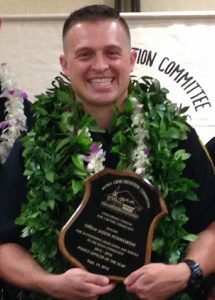 Also honored at Friday’s ceremony were the other “Officer of the Month” recipients over the past year, who stood on the stage when the “Officer of the Year” was announced: Officer Darren Cho, Officer Marco Segobia, Officer Kaea Sugata, Officer Brandon Mansur, Officer Bradden Kimura, Officer Peter Tourigny, Officer Nicholas McDaniel, Officer Officer Brian Beckwith, Officer Mike Thompson and Officer Wyattlane Nahale.